We are huge fans of the LeapFrog range. C owns Read with Me Scout, My Talking LapPup and the Fridge Phonics which has helped him learn his alphabet very quickly. 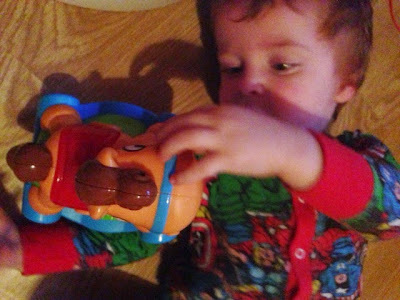 He was recently given the opportunity to try out the LeapFrog Roll & Go Rocking Horse and I knew it would be a hit. It's aimed for children aged 6 months to 36 months so with C being 28 months he's perfect for it and E will be 6 months in March so both of them will get the use out of it! He was so excited when I opened it out of the packaging and couldn't wait to get playing. There are 3 ways to play - you can push down on the horses saddle and it will light up and speak which encourages your child to interact with it. Rocking it backwards and forwards (building key motor skills) makes it sing a song which C loves. He tries to sing along but can't quite get the words! You can also push it and it will speed along the ground. This is perfect to get your child chasing after it and would be good if your baby is learning to crawl as it would motivate them to go get it. 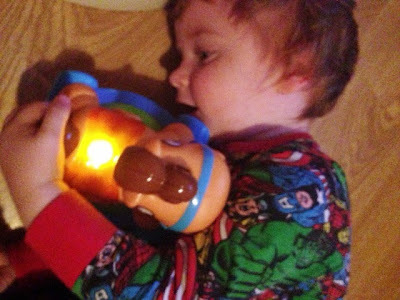 It's a great educational toy for little ones. C's favourite toys have always been ones that light up and have music and when he's been playing with it, E has been watching him. I'm sure she can't wait to get playing too! It is a lot bigger than I thought it would be and it's quite heavy too which is understandable as it's supposed to wobble. It has two volume settings which is great for when it starts to get too much for mummy! 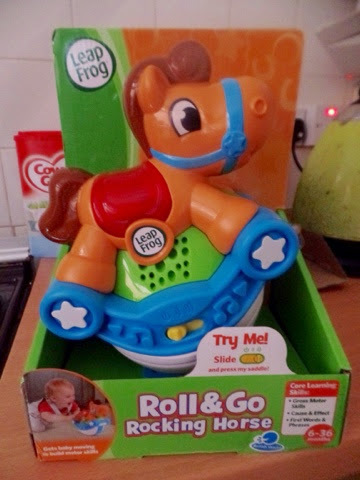 The Roll & Go Rocking Horse retails at £12.99. You can find out more about LeapFrog at their website. You can also follow them on Facebook and Twitter.